For those of you using Scrum, Scrumban or just Kanban, you might be wondering why it matters to limit the Work In Progress (WIP) in a given queue. It therefore makes sense to decrease the cycle time by reducing the maximum number of items in progress (WIP). … is to get things done. Reducing WIP will give you the ideal setup to accomplish this goal. It avoids that items are clogging up your queues and, by consequence, avoids that people in the team are facing a backlog too big for them to handle. 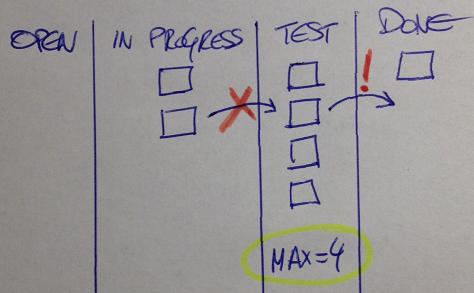 In a typical scrum team, the first queue that will clog is the ‘ready for test’ queue. By limiting the WIP, developers aren’t able to push any additional items to the test queue, unless they actively take part in testing themselves to reduce this queue. In the above image, the max WIP is 4 items, so the developers can not push any more tasks to the test queue. Instead they should help the testers get tasks moved to the ‘done’ queue. Reducing WIP also increases the self-organizing behaviour of a team. The above example shows that an efficient flow can only be achieved by a true cross-functional team, where every team member is able to take over another colleague’s work. Do you see additional benefits of reducing WIP?